​For the Pernod Ricard Campus realization, the tradition had to follow a very current spirit within a luxuriant and preserved nature, by blending in a historical site. Its non-ostentatious architecture adopts a principle of directional axes serving the various poles of the program, taking care to avoid any effect of mass or volumetry off scale. The project extends linearly over 10 ha in the middle of a 180 ha forest. It integrates perfectly the constraints of the natural site in which it is registered, in particular a withdrawal of the edge, a swampy ground and protected species. Indeed, the choice of the initial field - the former training ground of the XV of France - is revealed quickly unthinkable; a precious (and invisible orchid) grows and will have, in mistress of places, the last word. This flower will give the tempo of the project, inviting to occupy its territory but not at any price! The project will deploy well on the site but within the limits imposed by nature, ubiquitous and untouchable following extensive ecological analyzes carried out upstream of the project. For this, "the cellar" and "Hameaux" were built on a plot of concrete pads themselves placed on micro piles thus raising the whole in order to let the water circulate as much as possible. Bridges connect the different poles of the site to contain a time of walking to 3 minutes maximum. Pernod Ricard is equipped with a powerful and technological work tool. Four major poles, four different architectures, four unifying materials: stone, wood, concrete, metal. A goal: To be good to produce better. The project is part of a HQE and BREEAM approach of Very Good level. First contacts with the campus, the existing Priory and Orangery are "recycled" in a spirit of calm and serenity. In the respect of their traditional morphologies, the extensions revisit them in contemporary materials. The new roofs use the slopes of the original building, while their brick layout rubs the oversized tiles. The details of masonry marry old and new, the colors play the contrasts between the slate, the copper, the stone, the metal ... A game of perspectives between the interior and exterior spaces generates each time a view framed on the following sequence. 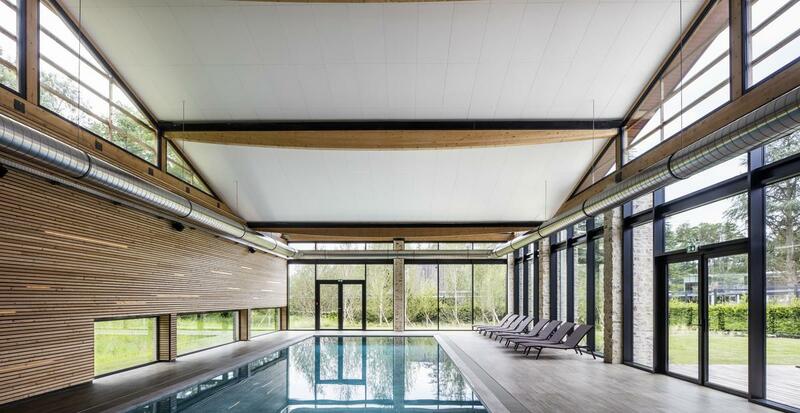 Pool side, the roof unfolds like a copper sheet along the entire length of the swimming pool. A bay at the bottom allows swimmers to enjoy the spectacle of the surrounding nature that is offered to them. The garden of the Priory has been reinterpreted while the inner courtyard respects the codes of a village square. Alternating mineral and vegetal strata, the CHAI wife with delicacy and discretion the site. By its pure forms, its architecture seems to disappear for a moment: the reflection of the surrounding nature on its mirror-polished facades extends the park while playing with the light and the landscape. The concrete structure is organized in shells held by posts in free plan. Insulation partly based on wood fiber was used to insulate the underside of the building. An air permeability test of the facades was carried out. Very airy, the interior space includes - around a generous hearth - an amphitheater, an auditorium and sub-committee rooms open on the park for meetings in the heart of nature. The home automation provides a permanent link with the outside. The conviviality being at the heart of the project, visitors enjoy in addition to lounge areas, a restaurant, a bar and even a "barrel" tasting of great wines. 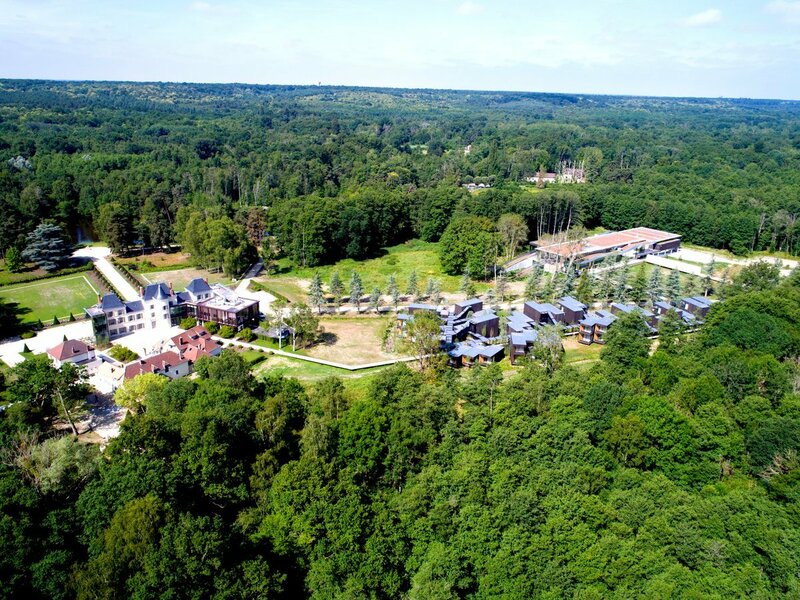 On the edge of the forest, the HAMEAUX are distinguished by their contemporary architecture in sourced organic wood. Delivered ready-to-plugger by exceptional convoy, the 57 prefabricated modules in the workshop to reduce CSR, the production of waste and reduce the duration of the site to protect the animal species of the site, home to as many rooms. The orientation of each of them was chosen in order to optimize energy expenditure (no air conditioning) and thus achieve the HQE and BREEAM certifications. Turned as much as possible towards the surrounding landscape, the bungalows are cleverly divided into hamlets of light and dark wood - with the appearance of hollow tree trunks - irrigated by a long covered walkway, serving as sap. Resting on stilts, the ensemble levitates above the biotope thus preserved. Each house of about 23 m² has a terrace and an unobstructed view of the surrounding vegetation. Since the hamlets, the user arrives at CHÂTEAU by a landscaping that restores its nobility to this facade too long denigrated. In this pole reinvested by the light thanks to a creative design, a spectacular bar of 35 m white quartz backlit goes around the room alternating tasting areas, benches and even a library where the bottles of the famous brands of the group are highlighted. On the first floor, the restaurant is totally open on the bar. Three rooms on the last two levels have been renovated with sobriety. In an ecological concern, the place is equipped with a pellet boiler. Two lateral wings housing the vertical circulations release more surfaces to the reception rooms and make them accessible. The cubic and suspended kitchen, treated in mirror polished stainless steel at the back of perforated lacquered steel panels, recreates the rear square courtyard. The four poles integrate into the surrounding landscape without denaturing it and respecting the plant and animal species inhabiting the site. Biological corridors have been planned to allow animals to continue to circulate freely and without danger to humans across the estate. Regarding the sanitation network, it is connected to the system of the city of Clairefontaine. The internal network limits the impact of the built parts by playing on existing ditches and valleys to channel all stormwater and runoff. A selection of already well developed plants has been made to avoid loss. The felled trees were reused to make a fence. In the landscaping part, it has been planned crossing ropes. Finally, the car park has been designed in permeable pavement. One of the challenges was to connect in a 180-hectare park and in less than 3 minutes on foot, all the buildings of the site ... Betting successful! The various entities were deliberately positioned near the immediate vicinity of the Castle, to avoid traveling too great distances. The privileged access is by the RD27, coming from Rochefort. The problems of car parks, deliveries and other transits are managed directly by this main entrance without hindering the pedestrian circulation and the tranquility of the visitors. The second entrance, closer to Clairefontaine, opens fully onto the forest and the main water feature of the park, free of traffic. Cars and other vehicles such as buses park at the landscaped parking lot near the Prieuré.The aim is to give priority to pedestrians in this natural and wooded site, and to respect the listed areas of bio-diversity. Finally, in order to limit the ecological impact, carpooling of visitors is favored.